Former Senate Majority Leader Harry Reid is finally leaving Washington D.C. after decades of stonewalling and bogus lies lobbed against his political opponents. Reid has a history of purposely saying egregious and untrue things, but as he walks out the door to retirement he may have sunk to new low. During an interview with Buzzfeed Tuesday, Reid jumped on the election temper tantrum bandwagon and argued (without evidence) Russian hackers had an influence on helping Donald Trump win the White House. He then proceeded to say, effectively, that Trump's win is as "big as 9/11" and argued electors have the right to be briefed by the intelligence community before casting their final Electoral College votes on December 19. "I think this is as big a deal as Watergate, as 9/11. I think they should have a 9/11-type commission. I know that [US Sens.] Dianne Feinstein and Ben Cardin and others are calling for that. 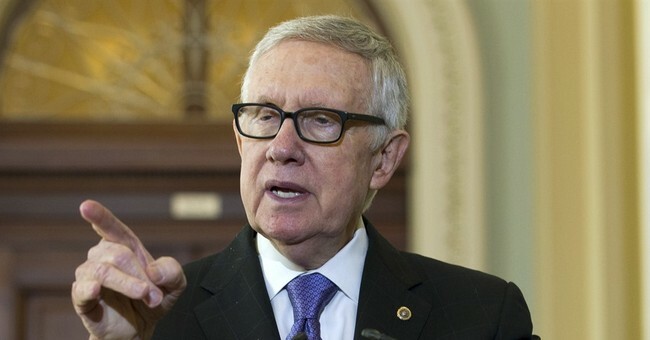 I think it’s a step in the right direction,” Reid said. The head of the Director of National Intelligence, an Obama appointee who overseas all U.S. intelligence agencies, said earlier this week there isn't evidence to prove Russians changed the outcome of the election on November 8. That didn't stop Reid from comparing the hacking, which he claims led to Trump's victory, to the murder of 2,996 people in the worst terror in American history. Don't forget to keep it classy in retirement, Senator.